Alessandro Giovannelli, associate professor of philosophy, has for years probed for deep aesthetic relationships in movies. Recently, however, he was surprised to learn he’d become the source material for one. OK, so it wasn’t a motion picture of the silver screen variety, like one of the masterpieces Giovannelli spends so much time mulling; it was an eight-minute YouTube video. But for a professor of philosophy, among the quietest wings of academia on most campuses, the video was hardly small. The filmmaker, well known in movie circles, was Evan Puschak, writer, producer, editor, and host of The Nerdwriter, a weekly YouTube series on art and culture. 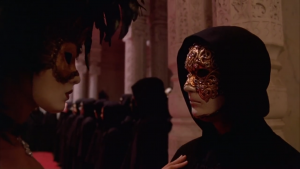 His video—Eyes Wide Shut: The Game—cites two of Giovannelli’s papers and borrows heavily from his ideas. Since it was posted in July, the video has been viewed about 480,000 times according to a recent tally. That’s a larger audience than Giovannelli has ever played to. Perhaps more gratifyingly for the professor, more than 18,000 people have clicked the video’s “like” button. “It’s nice to scroll down [through the comments] for me, to see a viewer write ‘Oh, finally I get it!’” Giovannelli says. The video borrows from his 2010 paper “Cognitive Value and Imaginative Identification: The Case of Kubrick’s Eyes Wide Shut.” Eyes Wide Shut, released in 1999, was the late Kubrick’s final film. Starring Tom Cruise and Nicole Kidman, it follows a series of bizarre, sexually charged events surrounding a young couple whose marriage has ridden into shaky ground. Noted for its unusual style, the film drew some negative response at the time of its release. Some critics said the film suffered because they found it impossible to identify with Tom Cruise’s character. Giovannelli, however, says that’s part of what makes Eyes Wide Shut so effective. When you identify with a character, he says, whether you’re feeling sympathy (you want to help) or empathy (you can understand what the character feels), you attach all of your emotions about experiences in the story to that character. If you feel a distance from someone in a movie, Giovannelli says, you instead develop a deeper connection with the action. He calls it “experiential identification.” So does Puschak in his video, citing the professor. Giovannelli’s philosophical analysis extends to artistic endeavors beyond movies. But film has taken a larger share of the professor’s attention in recent years. A paper on another Kubrick-related film, 2001’s AI: Artificial Intelligence, is the cover story in this year’s Film-Philosophy, an academic journal. 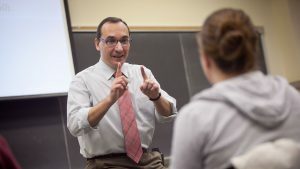 His film analyses are case studies for the professor’s theories on how viewers relate to characters, and often audience relationships with characters have much to say about real life.